We all have that friend. You know the one. He believes in cities on the dark side of the moon, angels, and insane conspiracy theories. Occasionally, he’ll come across a picture of the “supernatural” he found on a website and self-righteously point to it as proof that the universe runs on crazy. Well, next time he tries that, go ahead and mention these cases of the paranormal that are anything but. The surgeon’s photo is the most famous picture of the Loch Ness monster, and it almost single-handedly started the Loch Ness craze. Whenever anyone thinks of Nessie, it’s undoubtedly this image they picture. 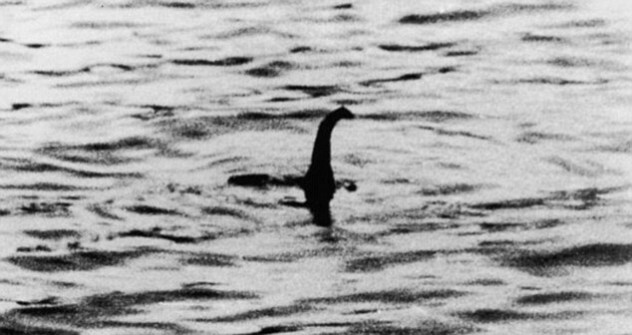 It was allegedly taken by a gynecologist and his wife who were on holiday, driving along the banks of Loch Ness. Unfortunately for all the “scientists” who’ve wasted decades investigating Nessie, the photo was 100 percent fake. The monster in the picture is simply a toy submarine. The plot to create the fake photo was revenge for a slight by the Daily Mail. The newspaper had ridiculed a man named Wetherall after investigating what he claimed were Nessie’s footprints on the bank but turned out to be those of a hippopotamus. Wetherall and his accomplice aimed to humiliate the paper with another fake, but they kept quiet when the image captured the public imagination. The Patterson photo was taken by Roger Patterson and his friend Robert Grimlin. 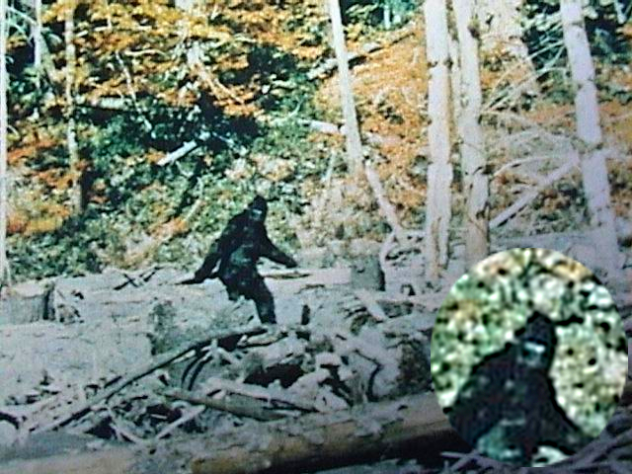 It’s probably the most famous picture of Bigfoot that exists and has been mentioned by everything from The Simpsons to Will Ferrel’s Elf. The two were on horseback in Six Rivers National Forest, where they were shooting a documentary. According to them, they just happened to see Bigfoot—while filming a documentary about Bigfoot. Unfortunately, several people have come forward to admit their complicity in the hoax. They include the man in the suit (come on, like you actually thought that was anything other than a guy in a gorilla suit), a special effects artist who created the suit, and one of the producers of the film. 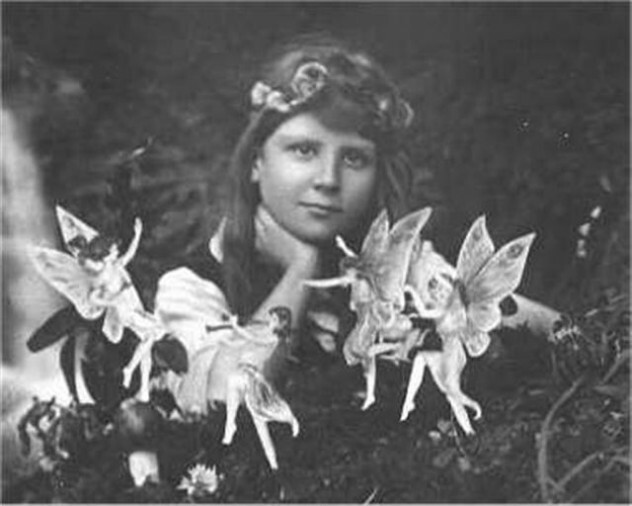 In 1917, two little girls captured the public imagination with the claim that they found fairies in their garden. Usually people wouldn’t believe such a claim from two little girls, but they had pictures to prove it. Even famous skeptic Arthur Conan Doyle, the writer of Sherlock Holmes, was fascinated by the photos. He wrote about them in his persoal magazine, claiming that they were definitely real—except they weren’t. The girls admitted (70 years later) that they used cardboard cut-outs and posed them in front of the camera. Did we mention that Arthur Conan Doyle wrote Sherlock Holmes? Mulmer was a jewelry engraver with a hobby in photography. Oh, and he also took photos of people with their dead relatives hovering in the background. That photo above? 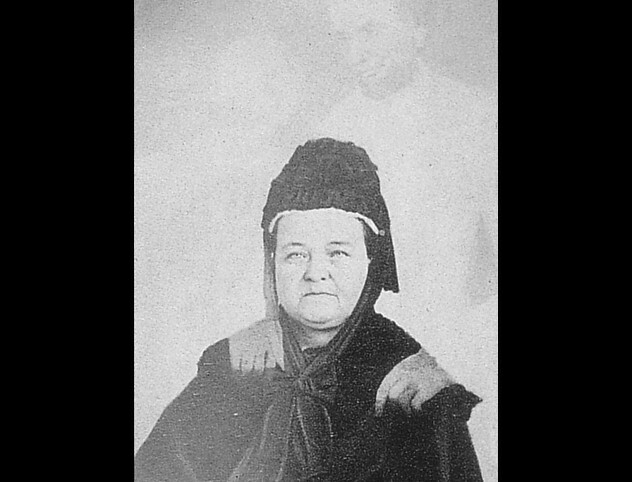 That just happens to be Abraham Lincoln’s widow. No prizes for guessing who the tall, bearded man behind her is. However, not everybody was convinced that Mulmer was photographing real dead people. 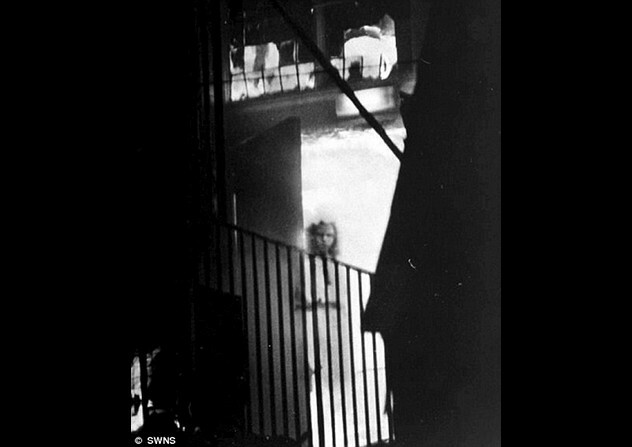 A court case pointed out that the effect was easily achieved by double exposing film, and most of the ghostly figures were still alive and had recently sat for photos with Mulmer themselves. The Venusian scout ship was photographed by George Adamski, who claimed he was contacted by Venusians on multiple occasions. Despite Adamski’s claims sounding like the sort of science fiction that would be rejected by the SYFY channel, Adamski wrote books and conducted lectures about the multiple contacts with the deep-space Aryans and even gained an audience with the Queen of the Netherlands. Except, of course, it was all a lie. The interstellar Venusian spaceship is just a lampshade with ping-pong balls attached to it. Ted Serios claimed to have a cool psychic power. Using nothing but his mind, he was able to transfer his thoughts to developing film. He did this by getting drunk and screaming while holding a small device he called a “gizmo” to the lens of a camera and getting someone else to trigger the shutter. 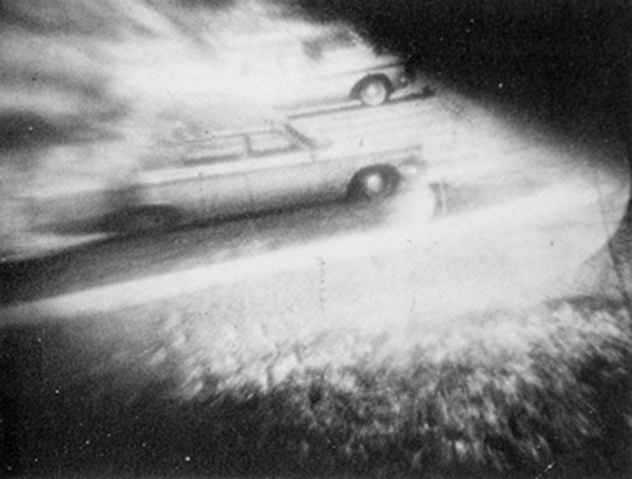 When the film was developed, it would produce a blurry series of photographs that showed cars, buildings, and people. He gained a lot of attention, appeared on television, and even had an episode of The X-Files written about him. But before you get excited, we’re going to have to burst your bubble. These photos were about as authentic as a tweet by Moses. It’s believed that the gizmo actually contained a lens with a transparent image on it. Later experiments were able to replicate images with the same effect. When the town hall in Shropshire burned down in 1995, Tony O’Rahilly snapped a picture. When the picture developed, he noticed a young girl standing amidst the flames where there had been an empty doorway. Her dress and appearance in the middle of the flames led to speculation that she was the ghost of a girl from 1677 that died in a fire that she’d started. The story made headlines worldwide. Years later, someone noticed an old-timey photo of a girl just like the one in the ghost photo. It turns out that the photo was a simple case of double exposure. The little girl from the old-timey photo had been inserted after the fact. In 1942, months after the attack on Pearl Harbor, an air raid siren sounded over LA. Anti-aircraft fire pounded the skies as spotlights shone on the aircraft that was hovering over the city. 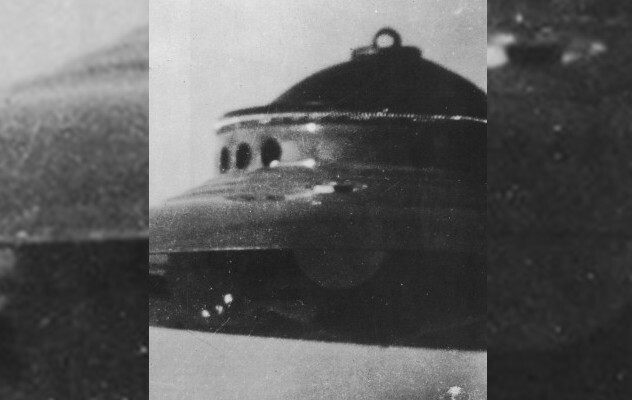 The next day, the newspapers reported that a UFO had been spotted over LA and they included a picture of said UFO, illuminated by spotlights. The government said it was all a misunderstanding, which only led people to suspect a cover-up. Were aliens invading? Well, no. It actually was a weather balloon . . . probably. The truth is that tension was already high: America had just suffered a pretty sneaky attack from the Japanese, and the Army and Navy simply overreacted to something totally innocuous in the sky. The spotlights only served to make whatever it was look more badass—especially since the image had been retouched by the paper to make it look more like a UFO. 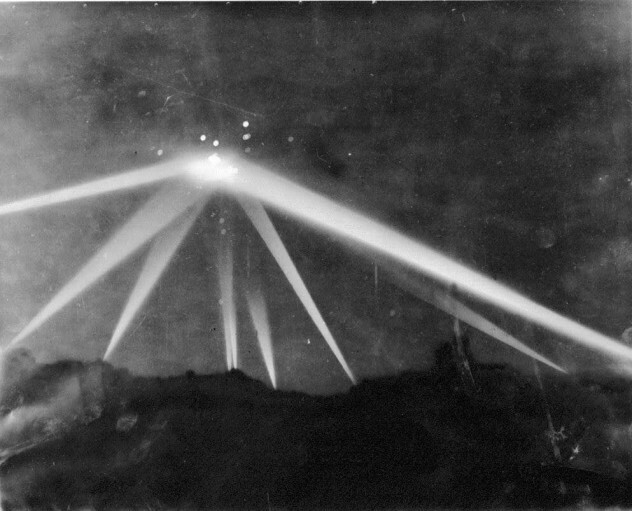 Years later, the same exact effect was replicated, proving that there was no battle for Los Angeles. Colin Evans was a Welsh spiritualist medium who claimed to be able to levitate; according to him, spirits lifted him up like a crowd surfer at an Aerosmith gig. But the truth far more mundane. The trick was done by by Evans simply jumping off his chair. 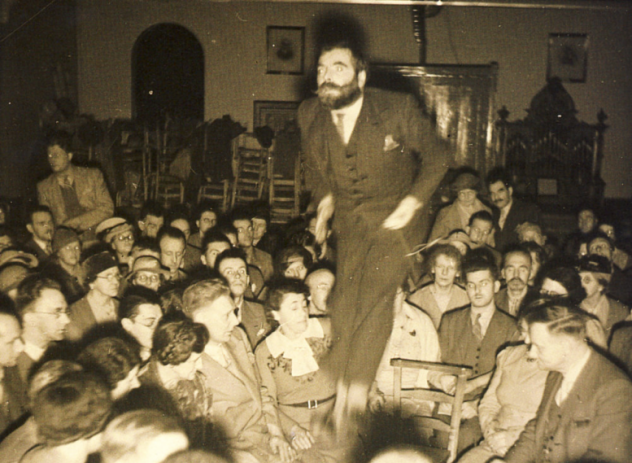 A cord in his hand triggered a camera, which captured the surprised looks of the crowd. Their shock at seeing a grown man hop out of his chair in his bare feet made them look like they were wondering how he’s floating. In reality, they were wondering why they spent their money on something so stupid. These same spectators would later ask for their money back. The picture above is of a 1941 bridge opening in Gold Bridge, Canada. 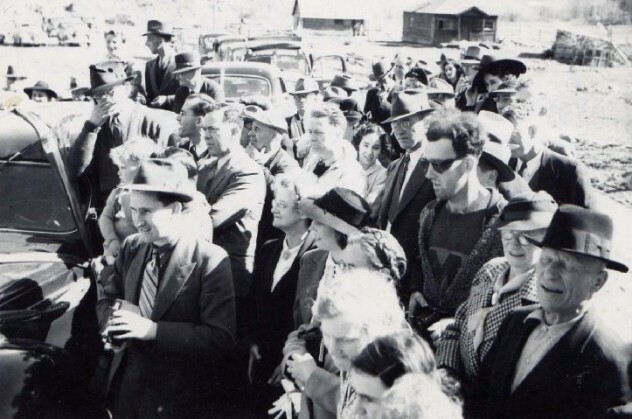 Despite the fact everybody else is dressed in typical ’40s clothing, the guy on the right is wearing a jumper with a large “M” symbol, dark glasses, and a fleece top, and is holding some kind of electronic device. When the Virtual Museum of Canada released the pictures, the internet was ablaze with theories of time travel. And to be fair, he does look out of place because people back in the forties didn’t dress like that, right? Well, actually, all the clothes our time traveler is wearing were available at the time. The glasses he’s wearing are identical to glasses worn by Barbara Stanwyck in the film Double Indemnity. His shirt is a football sweater, and the device is thought to be a camera.